It's amazing to think that just 10 years ago, flat-rate digital music streaming services were a mere gleam in the eye of industry executives. "You'd pay, say, $19.95 a month, and the music will come from anywhere you'd like," he told the New York Times. "In this new world, there will be a virtual library that will be accessible from your car, from your cell phone, from your computer, from your television." Of course, Spotify isn't the only streaming platform out there. Others have joined it over the past decade, including Apple Music, Amazon Prime Music and Deezer, as well as high-resolution music services Tidal and Qobuz. The Swedish firm is now a major player in 60 countries, including the world's biggest music market, the US, where streaming accounted for 51% of music consumption last year. Reflecting the huge impact that Spotify has had, its chief executive, Daniel Ek, has just topped US music industry magazine Billboard's latest Power 100 list of the biggest movers and shakers in the business. "For the first time since [former file-sharing service] Napster decimated music sales, the recorded music industry is showing signs of growth, and that reversal of fortune is largely due to one man," Billboard said in its citation. 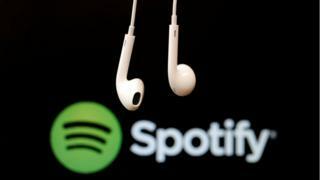 The magazine also hailed Spotify as "the place fans discover music as well as consume it", pointing to its promoted playlists, including its Discover Weekly service. There are various issues behind this move, not least of which is that Spotify needs to conclude new long-term licensing deals with the big three record companies - Universal, Sony and Warner - to avoid the risk of suddenly losing major chunks of its content. It's thought that Spotify currently pays 55% of its revenue to record labels in royalties, with additional money going to music publishers. Image caption Is Spotify now too big to fail? But at the same time, as Billboard says, "the entire music business now has an interest in its success". "If it's not already too big to fail, it's headed in that direction quickly," concludes the magazine.